About HyperV Technologies Corp. – HyperV Technologies Corp.
Dr. Doug Witherspoon President and Chief Scientist of HyperV Technologies Corp.
HyperV Technologies Corp. is a privately held fusion energy research and development company founded by Dr. F. Douglas Witherspoon in 2004 and located in Chantilly, Virginia U.S.A. 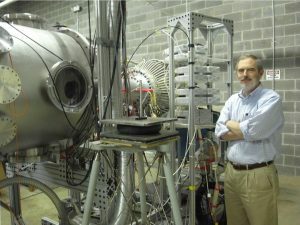 The company specializes in the development of unique ultra-high performance plasma guns for use in fusion energy, plasma physics research, and industrial applications. The name HyperV comes from the word “HyperVelocity” and references the extremely high velocities achieved by plasma when formed and fired from our plasma guns. Since its establishment in 2004, HyperV Technologies Corp. has received funding through a series of research grants from the U.S. Department of Energy’s Office of Fusion Energy Sciences (OFES). HyperV was awarded these grants and numerous SBIR’s, following a highly competitive proposal and rigorous scientific peer review process. In continuing the advancement of it’s most promising fusion energy research and development effort, HyperV has teamed with the legendary Los Alamos National Laboratory (LANL) of New Mexico. This HyperV/LANL partnership is focusing on the design, development and operation of the PLX-α experiment located at LANL in New Mexico and funded by the DOE Advanced Research Projects Agency-Energy. In addition to its plasma gun development effort, HyperV is developing extremely fast fiber-coupled imaging systems for diagnostics applications in plasma physics, aerospace applications and other industrial processes. HyperV Technologies Corp. is working to develop practical utility scale fusion energy to exceed the clean energy needs of the planet in the 21st century. Fusion energy has the potential to provide virtually limitless secure base load power with a minimum of environmental impact. HyperV is also an industry leader in the development of high velocity, high density plasma gun technology for use in high energy density physics research, spacecraft propulsion and industrial applications.